You’ve had your pre-trip vehicle inspection at a local shop like Action Gator Tire, and the bags are all packed. Now it’s time to plan how to keep your kiddos happy with healthy and car-friendly snacks. The first thing you’re going to want to consider is storage and delivery methods. You can save lots of time and unscheduled stops by making age-appropriate snacks reachable and placing some responsibility on your front seat navigator or an older child to handle distribution. Try suction-cup shower caddies for food storage while you eat, rather than balancing food on laps. This can also prevent your hungry kids from becoming a dangerous driving distraction. These same handy-dandy caddies can also be used to hold cards, crayons, and other activity items later on. Shoe organizers on the backs of chairs in front of your little ones make snacks easy to reach and can also be used for storing activities. Fill those pockets with portion packed food items, drawing tablets, stickers, and games. Cut up fruit or veggies in dippable stick shapes and pack containers with peanut butter, veggie dip, or Nutella. Apple slices are always a good go-to in that they’re not too messy, low-odor, and healthy. Store these in the shoe pockets. Make your own homemade trail mix and fill individual portion-sized bags. They will be easy to reach in the shoe organizer so kids can grab when ready – but no chocolate chips. We’ll explain about that later. There are healthy nut clusters you can buy that can provide important protein without getting lost in every crevice in your car. You can find plenty of packaged snacks these days from local stores that are both affordable and moderately healthy. The standard grab and go from the grocery store is no longer automatically a choice looked down on by super-moms. Fruit snacks, juice boxes, and granola bars are available with all levels of organic, gluten-free, or other dietary restrictions your family may follow. Now you can shop for store-bought snacks guilt-free. Keep in mind that everything that is a hit at home will have equal success on a road trip. We’ve also put together some guidelines on what not to pack for your next family trip in the car. Chocolate bars. Everyone loves chocolate, but there are a couple factors to consider here. First, chocolate bars have both caffeine and refined sugar. This means that children getting hyped up off of chocolate are practically begging for an irritable sugar crash later on. Also, chocolate melts, quickly leaving your sweet kids a sweet mess. And have you ever seen what melted chocolate does to a seat? Drinks without a lid, or at least one that tightens securely. This goes double for sugary drinks that can quickly turn your front and rear consoles into a syrupy mess. Reconsider the crackers. From Cheerios to Goldfish, these snacks may seem like a good idea at first. However, due to their small size, they can quickly find themselves lost between seat cushions or crushed up and ground into your upholstery. This may be a good time to make the low-carb case to your kids. Any food with a strong odor. 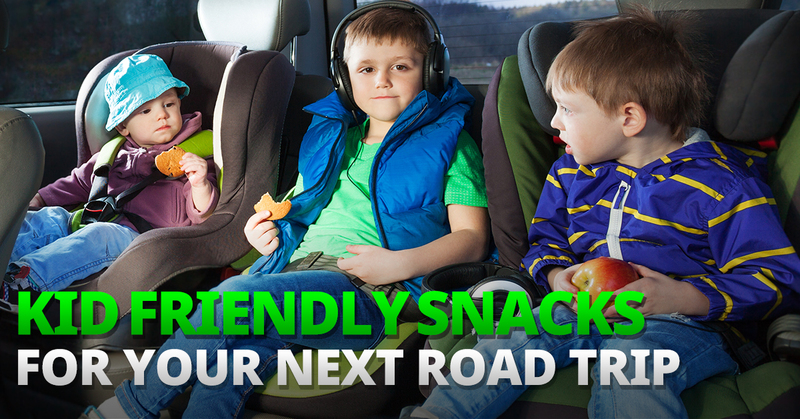 You’re going to be trapped in a vehicle with these snacks for an extended period of time. Don’t make things harder than they are. This goes for pungent fruits you wouldn’t think of like bananas. Tuna fish sandwiches are also a no-go, and don’t even think of bringing a durian fruit anywhere near your car! Snacks are a great way to keep the kids distracted and tide them over between meals. Just make sure you’re taking some driving breaks so everyone, including the driver, can stretch their legs, take a bathroom break, and have a real meal. A schedule is a good idea if you’re traveling with little ones. Book your hotels in advance and look for places with a swimming pool to give your family some exercise after a day in the car. If you want entertainment ideas, you can find a few on our blog that go over how to keep kids occupied.